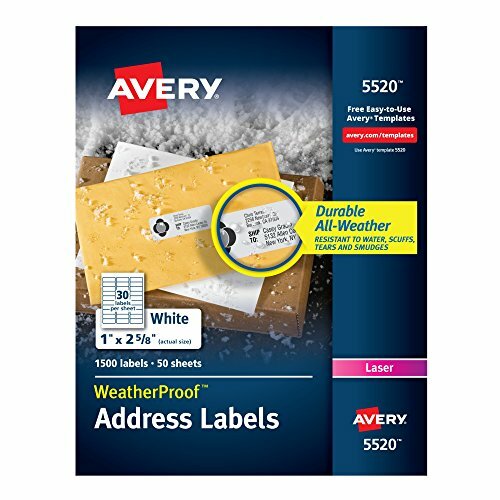 These WeatherProof Address Labels with TrueBlock technology are made of durable polyester to stand up against harsh weather and conditions.They resist moisture, scuffing, tearing and smudging. The UltraholdAdhesive sticks to tough surfaces ensuring your label won't fall off your package. With TrueBlock technology, the labels completely cover everything underneath so you can reuse boxes, mailing tubes, envelopes and more. Compatible with laser printers, the labels are simple to customize with sharp, clear text using free templates and designs at avery.com/templates.